Jim Harold Media LLC is not liable for the content of external sites or links. Just because we link to a single story on a website does not mean we necessarily agree with the editorial opinion or choices of that given website. 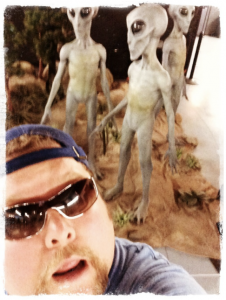 Jim’s Note: Recently, one of our listeners and professional writer Ryan Clark told us of an upcoming trip to Roswell and asked if we’d be willing to share it. The answer was, of course! Ryan’s observations, writing talents and opinions are his own. After a bit of a delay (sorry Ryan), here is the story of his long and winding road to Roswell. I liked it and I think you will too. FANNING, Mo. – I’d just stopped by a Route 66 outpost store – you see them along the way if you’re driving west on Interstate 44 – and I needed a drink. Nothing stiff – I don’t roll that way – but I needed something cold. I pulled in to a gravel lot, and to my left I noticed the world’s largest rocking chair. It had to be the largest – it said so right on the front of it in big, bold letters. To my right, on a porch outside the country store, an older couple sat in much more normal sized furniture, sipping what looked like icy sodas. There was a dry, summer heat in Missouri that day, but I opened the car door and noticed the wind had picked up. It felt to me like a storm could be brewing. I nodded to the older couple and walked into the shop. There were T-shirts and knickknacks and snacks – think Cracker Barrel without the food. A pretty blonde woman looked up from behind a counter and smiled. “Hi there – what would you like?” she asked. I smiled. “South is where I’m heading. Taking Route 66 all the way to Amarillo. Then going to Roswell for the UFO Festival.” I took a swig of the drink. It was good. She was right. I didn’t know it then, but she was right. I took another swig and walked out the door. CLICK HERE TO VISIT RYAN’S SITE AND CONTINUE ON THIS ADVENTURE…. Salem Graveyard Ghost Captured On Film By Pro Photographer? As part of The Paranormal Report weekly video podcast that I co-host with Micah Hanks, we receive great user submissions of ghost, UFO and cryptid video. This one has to be the best yet. Professional photographer Benjamin Martin of New York sent us the following photo featured in the short video below. It is simply amazing, check it out. Thanks Benjamin! As you can imagine, I have several cameras both digital and film and love to shoot on both mediums. I brought along a somewhat novel 35mm camera that I have loved to experiment with as a B camera. It is called a lenticular camera and has four lenses across the front firing all four at once across what would otherwise be 2 standard 35mm frames. It ended up being a few weeks before I was able to drop off and pick up the rolls of film that I had shot in Salem. Excited to see the photos, I stretched the film out on a light table right there at the lab. When I came across the following images, I had a visceral experience that I can only liken to doors of perception thrown open. and it has left us all stumped! I have included a raw scan of the film as well as one that I have adjusted for exposure and removed dust for reference. If you know anyone that has any explanation for this, or has seen something similar, in Salem or elsewhere please let me know! Other than a handful of friends and colleagues, no one has seen these images, and only myself and my Father have bore witness to all four frames of the uncut film. I’ve been listening to your shows for the last 2 years or so and love what you do. I never thought that I’d be sending you something like this! If you enjoyed this video, check out the full length weekly Paranormal Report program on iTunes, at JimHarold.com, GralienReport.com or subscribe to our YouTube channel HERE. NASA says that not only do they think that ET life probably exists, they are now saying that we will likely discover it in the next 20 years due to recent improvements in technology including the upcoming Webb Telescope. Now whether you believe that ET has already been discovered and covered up or not this is still an amazing development. Here is the full video event as posted on YouTube by NASA. Get a cup of coffee, it is about 87 minutes long but very interesting. This morning as I was perusing paranormal news, this item caught my eye. “Photobombing” is all of the rage these days, but in a way the original photobombers came from the early 20th Century and were spirits…well, sort of. They were faked “spirits” that showed up in posed portraits. These were the work of a particularly deceptive guy by the name of William Hope who traded on the emotions of many gullible people hoping to get a glimpse of a passed loved one. Does this deception mean that we should reject any possibility of paranormal phenomena? Of course not. However, we must remember that unfortunately there are probably a lot of William Hope-like people out there waiting to take advantage. As I always say, keep an open mind but not so open your brains fall out. Regardless, the photos are great to look at from a historical viewpoint and just plain creepy. DangerousMinds.net has a great story on them today with lots of examples. Check the story out HERE. The startling footage we featured on The Paranormal Report of a young woman following a Ouija board session might have a more logical explanation after all…according to the Daily Mail, the woman was using powerful psychoactive drugs WITH the talking board. Particularly sad is the fact reported by DM that she was an orphan trying to use the board and the drugs to contact her late parents. This Fortean tale is fascinating. This woman claims to have awoken living in a world that is much the same yet very different. Is it a case of mental illness or something more profound. You be the judge. These are the kinds of stories that lend credence to the idea that sea monsters may, very well, be real…love it! Scientists track a shark and determine that it was eaten by a sea monster!!! Note: Steve was a guest on my Crime Scene podcast which is part of my Plus Club. A fascinating gumshoe! For those who believe that vampires are only part of fiction, be aware that ancient peoples believed in them and acted accordingly. Archaeologists have recently unearthed a skeleton which was likely the recipient of some “precautionary” treatment at the time of his burial should he decide to awake from the dead. A stake driven into the body of a 16th century vampire. Very spooky!